New York (also known as the Big Apple) offers an amazing choice, whether it be gay bars, dance clubs or simply shopping. The city, with the history of Stonewall, has a lively LGBT community and it is not without reason that New York is known as the city that never sleeps. Seven days a week you can find what, and also possibly who, you're after - no matter which part of the city you may be staying in. Gay culture has spread its wings throughout New York and the well-known gay areas such as Chelsea and The Village are no longer your only option. Venture over to the Upper West Side or Queens or Park Slope, Brooklyn and expand your options even further. 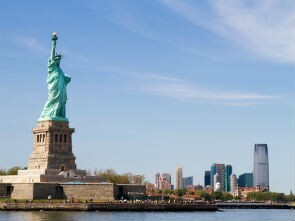 Tourist areas in Manhattan are generally safe, and the city has experienced a dramatic drop in its crime rate in recent years. The legal age for purchase and consumption of alcoholic beverages in New York is 21 years of age! If you want to purchase alcohol, expect to be required to show proof of age at bars, nightclubs, restaurants and stores. Further, please be aware that carrying an open container with alcohol in public places is illegal! Events 2017: Aids Walk 21.05., New York Pride 25.06.